Mining for profit now goes hand in hand with mining for the greater good – for all. The new El Dorado of the global extractives sector lies in ‘responsible mining’. It’s not enough to dig out the metals and minerals needed to manufacture everyday goods, power cars and smartphones, and create luxury jewellery – companies have to demonstrate that this is done in an ethical, sustainable and responsible manner. 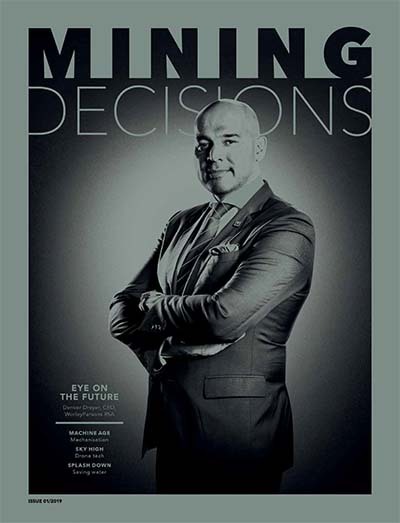 Sustainability has transformed from being an after-thought to a fundamental component in the integrated, digitalised mine of the future, which strives to improve not only operational efficiencies and shareholder value but also considers environmental, social and governance (ESG) issues that will ultimately benefit the communities near and beyond the mines. Yes, technological advances such as automation and remote operating centres, robotics and artificial intelligence will reduce the size of underground labour forces but it will also improve safety and working conditions, and by no means make humans redundant. The success of the future mine will hinge on human skills such as decision-making, people management and interpersonal relationships including with mine-affected communities. Being a responsible mining company has become an urgent business imperative – an unstoppable trend that is reflected in several sustainability ‘firsts’ in 2018. 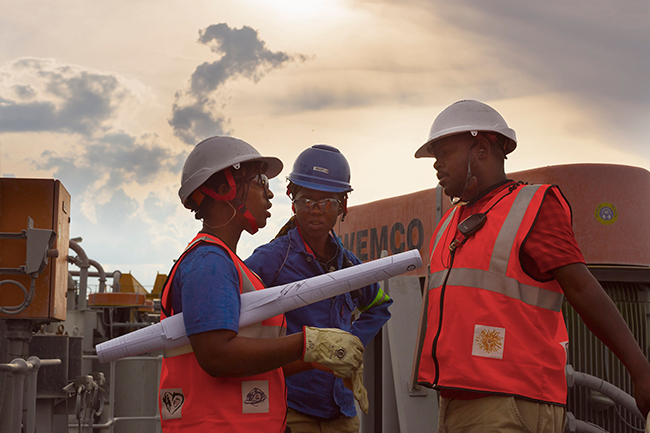 One of these took place in March, when Anglo American revealed its innovative, holistic sustainability strategy to ‘re-imagine mining’, which focuses on three pillars (namely environment, community development and driving greater trust and transparency across the industry). The group’s ambitious goals – to be achieved by 2030 – include creating five jobs off-site for every job on-site in its host communities; working with government to ensure every school in the host communities performs among the top 20% of state schools in the country; reducing greenhouse gas emissions by 30%; improving energy efficiency by 30%; and reducing freshwater abstraction by 50% in water-scarce regions. In another ‘first’, the 2018 Mining Indaba in Cape Town dedicated an entire day to sustainable development. Mining ministers, executives and other stakeholders took part in panel discussions and workshops, searching for a common vision for sustainable develop­ment in the industry on the continent. The topics primarily targeted socio-economic sustainability, with topics such as ‘best practices around community relations and development strategies’; ‘from compliance to shared value’; and ‘the deficit of trust between mining houses, communities and governments to build a balanced relationship that will last’. In April 2018, environmental sustainability moved into the spotlight when Rio Tinto became the world’s first company to be certified under the Aluminium Stewardship Initiative, the highest internationally recog­nised standard of its kind. ‘Responsibly pro­duced aluminium has a key role to play in driving human progress, as a material of choice to reduce carbon and increase recycling across a wide range of end products, from food packaging to buildings, planes, cars, mobile phones and computers,’ according to Alf Barrios, CEO of Rio Tinto Aluminium. April also saw the inaugural Responsible Mining Index. 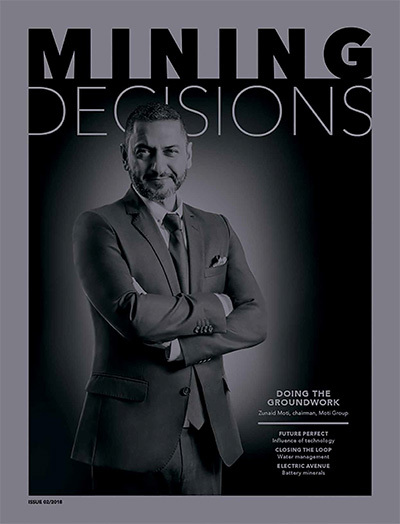 It assesses 30 mining companies that produce 25% of the world’s mined commodities, including coal, copper, gold and platinum, in six areas (economic develop­ment; ethical business conduct; life-cycle manage­ment; community well-being; working con­ditions; and environmental responsibility). ‘Responsible mining is a realistic goal – it can be done,’ insists the Netherlands-based Res­­­pon­­sible Mining Foundation, pointing out that 19 of the 30 companies rank among the 10-strongest index performers for at least one of the six thematic areas. The index found that many companies had made progress in limiting carbon emissions and tackling corruption, but that human rights issues (such as preventing sexual exploitation of female mineworkers) requires more attention. While good community relations form a fundamental part of responsible mining, it’s difficult for mining companies to know who to speak to, and how. 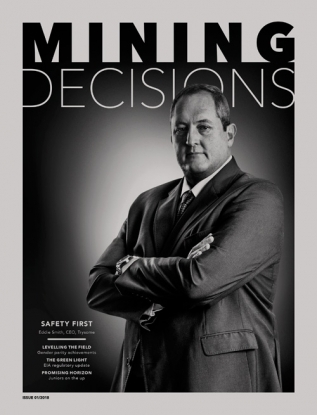 A study released in March by Wits University’s Centre for Applied Legal Studies found that most communities said they had not been consulted and were unaware of commitments that mining companies made in their social and labour plans (SLPs). Hart, who has worked with mining com­munities in 13 African countries, argues that effective platforms are needed to enable mining companies to engage actively with their host and labour-sending communities. While there are platforms (such as the Chamber of Mines, regulatory SLP framework and Mining Charter) for companies to engage with their peers, government or organised labour, few such structures exist for robust and inclusive community engagement. Here digital channels could become useful. Hart cites Amplats’ award-winning Alchemy project, which is looking into giving ordinary community members a voice through their mobile devices, using free WiFi and interactive digital platforms. The latest thinking propagates ‘mutually beneficial partnership engagement’ between miners and communities, according to Hart. This also takes significant work behind the scenes, for instance by formalising a company-wide ESG strategy and integrating it into every business unit – then monitoring and evaluating everything before multiplying the successful aspects. 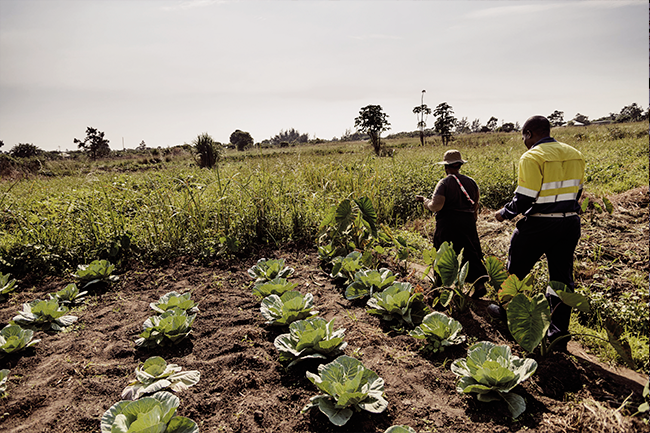 AngloGold Ashanti (AGA) recently developed such a common strategic sustainability framework that also embeds the UN Sustainable Development Goals into the business strategy. Mining houses are coming up with inno­vative ways to strengthen and diversify communities, beyond building the usual houses, schools and clinics as specified in their SLPs. 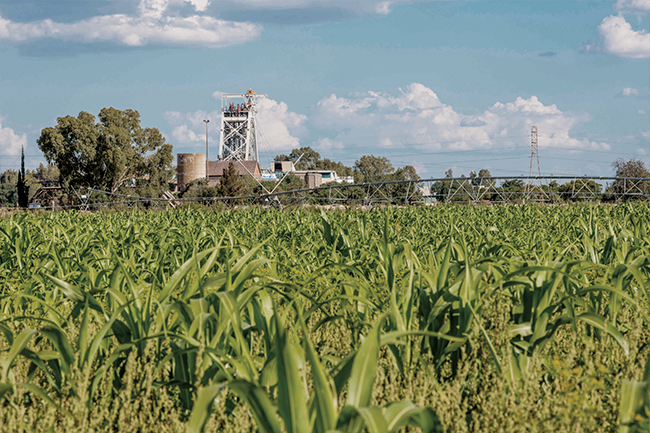 Harmony Gold, for example, has combined community job creation with renewable-power generation by planting fast-growing grass species as biomass crops on post-mining land in Gauteng and the North West province. Meanwhile, Exxaro is investing in community needs, including ‘housing for dignified living, schools for education and clinics for health and well-being’, according to Mzila Mthenjane, Exxaro executive head of stakeholder affairs. ‘Local economic development is also critical in strengthening communities,’ he says, adding that key economic developments include a women-owned farming enterprise that it initiated two to three years ago, and helping improve road infrastructure in and around Lephalale in Limpopo. ‘Looking ahead, we are planning enterprise and supplier development initiatives that will see further economic investment in our communities,’ he says. Meanwhile, Anglo American’s latest employee volunteering programme (Ambas­sadors for Good) encourages staff to form teams within their workplace or partner with community groups and bid for company funds to implement projects that support the group sustainability goals. Consulting with local communities has become so crucial that the University of Cape Town’s Graduate School of Business has intro­duced a ‘strategic social engagement practice’ course to equip corporates with skills ranging from developing patience, becoming good listeners and using appropriate language, to sharing information in an accessible way. Ultimately, the sustainability of the inte­­grated, high-tech mine of the future seems to be rooted in the low-tech art of human communication.